We invite you on a journey that will cleanse your body, clear your mind and raise your vibration. With a combination of vinyasa flow yoga, Native American tribal sounds and shamanic healing rituals, this workshop integrates ancient wisdom and healing modalities from multiple traditions. The pulsating sounds of shamanic drums, singing bowls, sacred chants and tribal music weave powerfully with guided movement, focused breath and mindful meditation. Together as one, we will cultivate our prana (life force energy), liberate our hearts and elevate our consciousness in an invigorating celebration of love and transformation. Nicole Doherty is a 500-RYT Yoga Alliance & YogaWorks Certified Teacher, subtle body energy healer, wellness coach and writer who spent 12 years on an extensive spiritual inquiry and in a disciplined yoga practice that empowered her to overcome multiple traumas in her life. What Nicole discovered on this path to wholeness fuels her passion to inspire others to heal the emotional traumas and unconscious patterns that reside within us all. Committed to embodying her truth in service, it is Nicole’s mission to facilitate a deep inner exploration, create life-changing breakthroughs and generate the self empowerment needed to reach one’s highest potential. Her contagious laugh, smile, and lightness of being coupled with her meticulous attention to details beget classes that have been described as fun, compassionate, brilliantly sequenced, and challenging in all the right ways. Sonic love travels in many dimensions—through visceral pathways of the senses, as a uniting force on dance floors everywhere, in movements spanning entire eras to unify—whether souls, states or nations. And as sonic love relates to house music, Marques Wyatt is a seminal force. Marques Wyatt has been the artery of the LA house music scene for decades. In a World Calling for Conscious Evolution, Holly Finds Joy in Serving as a Contemporary Spirit-Initiated Shaman. She in an expert in the field of Human-Energy Dynamics and serves as The Joyful Warrior – writing about and facilitating break-though experiences for individuals and organizations. She is inspired by the light that is the spark of the divine in each person’s heart, that which is the same as her own, and the creative principal behind all of Existence. She is committed to helping shape a harmonious future for humanity through positive change and conscious evolution in The Self & for The Planet. Find out more at HollyBaade.com. Saturday: An introductory weekend experiential workshop in which the classic method of shamanic journey work is taught. 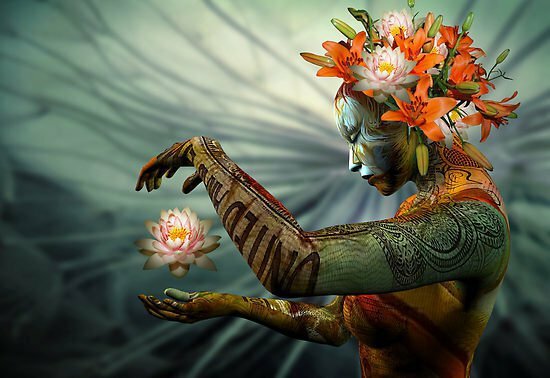 Utilizing the way of the shaman, we connect with the inner levels of reality, awareness and experience to find our spirit helpers and teachers, those inner sources who are intimately connected with our life purpose, and who provide us with power, protection, knowledge and support. Sunday: We invite you on a journey that will cleanse your body, clear your mind and raise your vibration. With a combination of vinyasa flow yoga, Native American tribal sounds and shamanic healing rituals, this workshop integrates ancient wisdom and healing modalities from multiple traditions. The pulsating sounds of shamanic drums, singing bowls and sacred chants weave powerfully with guided movement, focused breath and mindful meditation. Together as one, we will cultivate our prana (life force energy), liberate our hearts and elevate our consciousness in an invigorating celebration of love and transformation. 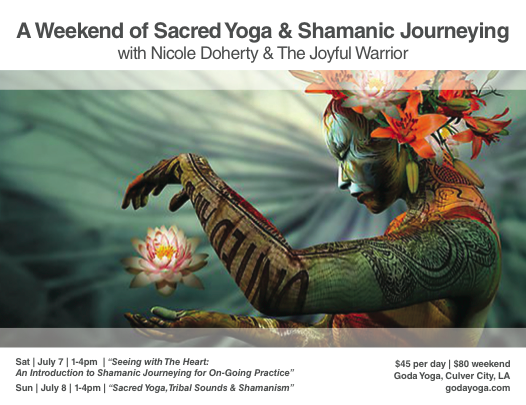 Sacred Yoga Ceremony by Nicole Doherty: 500-RYT Yoga Instructor Wellness Coach | Blogger | Spiritual Entrepreneur Nicole incorporates 10 years of spiritual practice and shamanic study into her unique style of Aya-YogaSM, an invigorating asana flow that integrates breath work, meditation, mantra, song and inspirational music. Her classes have been described as outrageously fun, brilliantly sequenced and challenging in all the right ways. Nicole’s mission is to facilitate a deep inner exploration, life-changing breakthroughs, and the Self-empowerment you need to reach your highest potential.